The Mardi Himal Trek is one of the Famous and hidden gem destinations in Annapurna Conservation Area. Every year average 100000 visitor goes to the Annapurna Region for its exceptional mountain views and to see the rural village life which gives the blend of Nepali and Tibetan Culture. 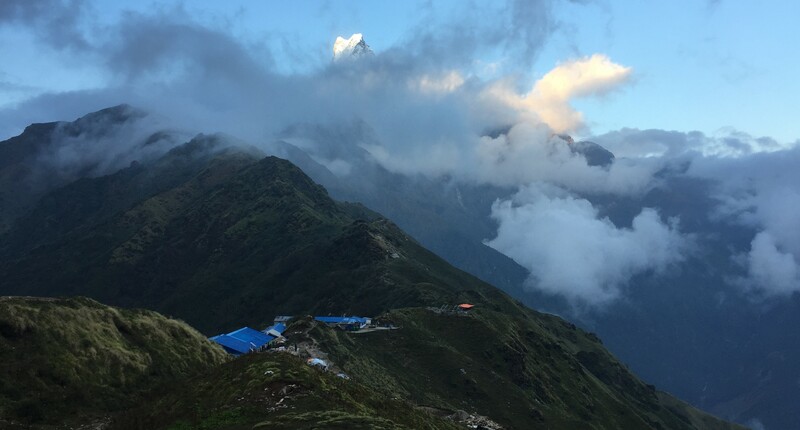 Recent few years, Mardi Himal trek from Pokhara is getting popularity among the adventure Loving Trekkers because of its wild Natural, Cultural Beauty and it’s great Mountain view from Mardi Himal Base camp. The Trek is considered as an ideal trek to feel Nepal Himalayan Region. This Trek offers a superb view of Himalayan Ranges like MT Hiunchuli, My Dhaulagiri, MT Fishtail (Machhapuchhre), mountain culture, lush valley and Beautiful valley of Annapurna Region. Lots of trekkers make their way to the Mardi Himal Base Camp, situated at the base of Mardi Himal and the impressive Machhapuchhre. The trail goes along small winding paths, through magical rhododendron forests until you climb out of the forest at an elevation around 4,300 m. The landscape changes quite abruptly into a rugged high mountain landscape. Today, we will enjoy the short drive from Pokhara to Phedi and uphill hike to Beautiful Dhampus Village. The hike is full of rhododendron and pine forests till Dhampus. Mostly Gurung people live at this Village with their own unique culture. Dhampus Village is also the best place to see morning sunrise and great mountain views of Annapurna ranges, Lamjung Himal and Manaslu. After morning breakfast and beautiful sunrise view from Dhampus, we will start our Trek uphill through the dense forest along with the spectacular view of Annapurna and Dhaulagiri ranges. We will cross Pothana another beautiful Gurung village full of ethnic culture. The way is also very rich in Biodiversity, wild Animals and various Birds. We will stay overnight to Rest camp near to Forest Camp. This day after early morning Breakfast at our Tea house we will hike up again along with dense Jupiter forest and beautiful mountain views. We will pass Low camp on the way and Trek is little steeper than other days. You will get a chance to see Himalayan Yak and sheep’s on the way to hike. After reaching High Camp, we will encounter the different view of Mt Fishtail (Machhapuchhre) and Annapurna Ranges. After resting overnight at High Camp, early morning sunrise is must do an activity which going to be one of the memorable experiences. Today’s hike is little bit challenging with steep climb, narrow and rocky trails and you will reach at Mardi Himal Base camp which is at 4300 M from the sea level with a stunning view of various mountain ranges and a spectacular colony of Green Hills. After some hours of exploration around the area, we come back again to Low cam for our overnight Stay.